Today I entered #Odaka for the first time by train, the single railway that now connects the town to the rest of #Japan, narrowly cutting between forests and golden fields of rice made brilliant in the setting sun. In 2013 when I came here the first time the tracks were covered over in primal vines and the station was filled with rusting bicycles with cob webs the undulated in the breeze. After nearly 7 years of documenting life here, this journey represents my last trip to Fukushima in regard to the upcoming film. I’ve been so fortunate to have been able to share these with all of you here and I remain so thankful for your support. In the days following the meltdown there was a lot of talk about Fukushima’s legacy—but legacies, by definition, take time and while even 7 years cannot adequately describe the fate of Fukushima, at the very least we have a better understanding of the complexity rhat constitutes life here. Regarding what I saw here today, it's a challenge to reconcile my memories of the desolation following the meltdown because it felt so permanent and heavy. But with time that changed as all things do. Odaka historically escaped the worst and of all the places that were affected it it is now the furthest along in returning to something that resembles the town it once was. Still, in the time it was in the exclusion zone and then when residents still could not return, so many houses fell into ruin never to be lived in again. However, what does remain is the tremendous heart of people here trying to find a way forward. It’s complex and there is no one blanket description that can describe what life is like here, but taken together the pieces add up. As a near full moon rose this evening I took a walk through the town to see what it’s like now. First, there are cars again making the streets feel almost busy, but the town is still nowhere what it once was. Of the 12,000 former inhabitants 2,000 have returned, I’m told (this number might need updating). In my non scientific count empty plots just about equal the homes that still remain or that have been rebuilt, as seen here. Closer to the station Odaka has a couple of small industries have sprung up, there’s a volunteer center to help bring entrepreneurial innovations, a few small restaurants and a social club has opened and Tomoko has her lovely ryokan back where I will be staying for the next couple of nights. Tomorrow I will head to neighboring #Namie that was not so fortunate as Odaka. Parts of it remain indefinitely within the exclusion zone and few have moved back despite the fact that the center of town has been deemed to be habitable. October 4, 2017 #Fukushima update: Up at 5 for the first light of morning, but not after 8 hours of sleep after long travels. This is the view from Tomoko's ryokan, a little portrait of life that has returned to Odaka. 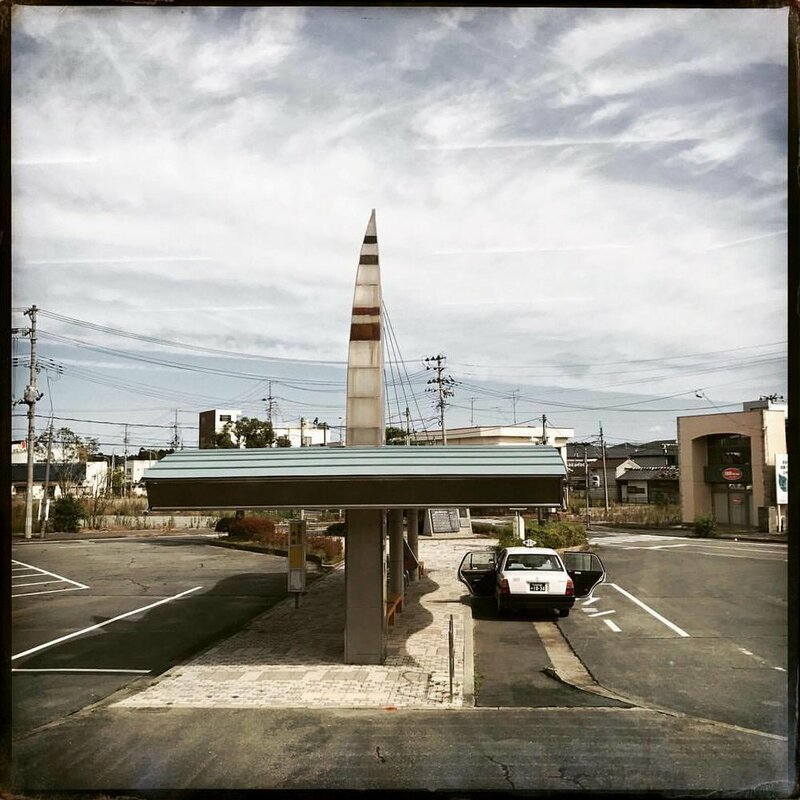 The image contrasts with so many that I've taken of abandonment, the memory of normal life mixed with slow decay following the hydrogen explosions and resulting spread of radiation from Daiichi, the power plant that made Fukushima synonymous with disaster. A little later on in the morning a new sound that I've never heard here also filled the morning: a passing train. Quiet and smooth sounding as it passed in the distance it was still notable, signifying a presence that I've never felt like this before. The station down the street is now open with hourly JR service connecting this place with the rest of Japan, I expect school children of nearby towns to be arriving later. October 5, 2017 #Fukushima update. October 5, 2017 #Fukushima update: I revisited #Namie this morning, a strange experience because it’s the first time that I could go there with its new status as an open town. When it reopened in April of 2017 there was a lot of fanfare about it—but the decision to open it seemed like an act to have people forget about the disaster more than anything else. By opening it, the suggestion is that everything is back to normal and therefor people should not worry any longer about what happened. Open status aside, it really is still a closed off place because in the time it was within the exclusion zone buildings crumbled and people who owned businesses moved—only 2% of the population have returned. Many of the elderly who might have returned sadly did not make it long enough to see their town “reopen.” …And on top of it, higher than normal amounts of radiation persist. Namie feels lonelier open than closed. When it was off limits and a part of the exclusion zone it existed as a representation of a place that once was more than actually being a place itself. The town represented a sad lament, it represented something that was once connected to life. In that time of lament there were still the old crumbling buildings with their hand painted and fading signs—I could feel the past in these withering structures. I could hear the conversations and clatter of classes that filled the bars and izakayas. Many of those establishments are gone now. Torn down, the space where they used to be are now austere flattened lots, antiseptic places that reveal nothing about the past and offer nothing for the future. Of the 18,000+ residents who used to live in Namie about 280 have returned. I walked past all of the main streets and did not see one open business aside from the post office, some administrative places and the gas station that is mostly there to service work vehicles. There’s a little food court along the main highway, but it did not look very appealing. Apart from those businesses, from what I understand, there are no social services or even places to get decent food nearby. Just outside the station, a lone taxi driver waited for a passenger to come off from one of the semi hourly trains, doors open as you’d find in many small towns here. But the train arrived empty and it left empty. The taxi driver, with nowhere to go, kept idling outside of the station reading his newspaper and waiting for customers in a town largely without people. October 6, 2017 #Fukushima update: I'm heading to Miyagi prefecture for the weekend to see some friends whose houses are nearly rebuilt. Affected by the tsunami alone I guess that could be considered lucky compared to what people in Fukushima still must contend with-the man made natural disaster. Before I left Fukushima last night I went to see how things were in Tomioka-it's now open to the the public, however still has many ton bags of irritated soil along the coast. My big fear is that if there is another tsunami this soil will end up in the water so time remains of the essence to move it to higher ground. As a reminder of the tectonic volatility still experienced here, we were awoken by a strong tremor last night. Thankfully the jolt only led to a brief swaying and nothing else. But with the ring of fire still very active another tsunami is not out of the equation by a long shot. Time is of the essence. One of the great things about working so closely with a community over the course of many years is that I come across moments like this one in one of the few businesses in #Odaka. This is HARIO Lampwork Factory and it makes the most beautiful and intricate glass jewelry. But more than that, it’s helping women make a living and raise their families. When I was there, there was anew born and he was constantly in the arms of one of the workers who was breaking so that he was never alone, something so important with families here doing all they can to make it back after losing so much. The shop has windows that look out onto the street and that was not an accident: people walking by can stop and see what’s happening inside and hopefully this will bring in more customers. Shot the other way around, the window reveals the current state of #Odaka with its withered landscape….but step by step businesses like this one hope to change that. And just to take a breath for a moment it's great to ride this train between #Odaka and #Natori. For the first time since 3/11 the railway is functioning. I love these small rural trains and I've wanted to ride this line for years. On a single track the small 2 car train passes by so much history here: small shrines in the forests that hug the tracks, rice fields bright yellow before harvest, mountains and streams the surround and pass underneath the tracks Forming interior arteries and heart of#Fukushima and #Miyagi-and now a vital link between friends, making people feel closer and a beautiful little part of this region that has endured so much right again. — in Soma-shi, Fukushima, Japan. October 10, 2017 #Fukushima and #Miyagi update: One of the most profound environmental landscape changes I've ever seen is the wall that's been built between the sea and land in northern #Japan. The wall rises about 10 meters (30 feet) and extends for hundreds of kilometers or roughly the equivalent of the distance between Washington DC and Providence Rhode Island which is the swath of land that the tsunami struck. Sadly the wall shuts off the sea from view and produces a walled in existence severing the connection to the sea that's existed in #Japanese culture since the beginning of its existence. The inspiration of those magnificent wood block prints and poems now obscured behind a cold flat wall. What the wall is also blocking is centuries of knowledge that's been passed down: farmers used to be able to read the tides because they'd flow forth from the ocean into land letting them know about tsunamis and other events-blocked off we are apart from it and I'd also apart forms an essential part of our collective human existence. I wonder if children born here now will even know what lies behind the wall if their parents don't take them up the high steps that Overlook the watery horizon? On the part of the authorities, walling it off is an act of massive denial: sea levels are still rising and the sea is still there, it's not going away. By building this concrete monolith we are turning our back on the wonder and love of something that has sustained us since the beginning and replacing it with a false sense of security. Ultimately we have only one choice with the sea: understand it and move with it or await it to breach our shortsighted strategies that only benefit the producers of concrete. #Fukushima update: I spent the last couple of days driving the back roads in Fukushima and these 2 photos for me are inseparable. In a sign of hope, solar panels have spring up all across Fukushima, many of them over fallow rice fields that are too contaminated to grow anything safely. Acutely aware of the dangers of nuclear energy, people here have begun transforming the landscape to accommodate this nonpolluting energy. Located within the original exclusion zone and under 10 km from the stricken plant (it will take another 50 years for it to be completely shut down), the panels are a big statement about the possibilities we can achieve with our advances in science. Sadly, on the day I took this photo, my country, the United States, announced that it will be investing in digging holes in the ground to renew coal production and return to centuries old practices that have polluted our word leading to rising sea levels which in turn inundated the power plant here. The rest of the world is literally looking to the heavens while the US sticks its head in the ground for cheap profit. On my second to last day in the region I drove through a dense fog on route 12 and found these bags of irritated soil, now covered over and piled alongside the road. As the fog rolled in it made me think of my own and the collective forgetfulness we all have at times. However, whether we remember or not, the fact of the matter is that this disaster is in many ways just getting started because the half life of the radiation will outlive us all. Indeed, on the mountain where I was staying there were hotspots that measured 1 millisievert. Even after the government had cleaned the area, radiation acclimated beneath a roof where water dropped when it rained. All throughout the region dense mountains are impossible to clean so when one place is declared safe it might only be a matter of time before nature blows the radiation back the the spot that was once cleaned. To counter our bad decisions of the past (and in the case of my country—present) so that we are not lost in the fog I can only hope that more solar springs up here and in all forward thinking nations. Despite the looming threats here, there have been light times here too, the result of people’s warm spirits—and it is those spirits that offer hope to a situation that seems all too bleak at times. Without the caring of so many people Fukushima would truly be hopeless, but like caring parents overlooking a sick child the people who have remained here will not abandon the place the love so much. If a doctor told a parent that their child was too sick to save, do you think the parents would abandon the child? Of course not—they’d try anything to save it. Likewise, the rest of the world and Japan might say that it’s hopeless here, but the people's caring here makes them try anything. Many times they fail, but some actions succeed. And it’s those actions, taken collectively, that add up into innovations that just might make Fukushima and the rest of the world a much better place to live in. Today I took a little day trip to the #Hiraizumi shrines and temples, which coincidently form a #UNESCO heritage site. On the train I read the the United States is further isolating itself from the wonders of the world by abandoning the #UN body that protects our shared human heritage and culture. This site here I'm sure will be just fine, honored and protected, however for those Americans (I'm looking in the mirror) who also love culture and the diversity that exists in this world, it's sad to not be contributing to these places. On a separate note, coming out of the exclusion zone in #fukushima it was a much needed day off. For the first time in almost 2 weeks I did not think about contamination when walking through fields and down age old passageways, reminding me of the psychological impact that so many still are grappling with in Fukushima as they are taken away from the wonders that once surrounded them. Taking a day off you really feel the contrast of life inside and outside of the disaster region. I hope that there are programs for people to reconnect with nature and hopefully visits to places such as this one. That UNESCO protected such a wonderful place that people from Fukushima can go to and take a much needed breath gives it all the more importance. October 21, 2017 #Fukushima update: I wasn't planning on being in #Odaka again on this trip, but I'm glad I came for a couple more days before taking a few days off and heading to a few much needed onsens next week. Today Odaka had its annual #autumn festival and many people came, mostly former residents who wanted to revisit their town, see friends and listen to music as the man was doing in the rain, squatting on the foundation of where a building used to be giving him now a clear view of the stage down the street. Since I arrived on this trip there have been small transformations and this festival with people in the town I have known mostly as an empty place is another transformation which also gives me conflicting emotions: I'm glad to see people enjoying themselves here and local businesses starting to make some income. On the other hand though I hope that the trauma and pain the meltdown forced upon so many people is never forgotten. With so many buildings gone here and in Namie I realized that the photos I've taken now sere as that memory of once was—the first time that I've seen my photos in the context of not just documenting the moment but having a place in history. And so, this photo too then is a part of that, history combining with the present and giving a clue about what we might expect for the future. At present Odaka only has 20% of the people who were once here living in the town. Neighboring #Namie has a slim 2%, the only hope I can see there is that perhaps a few very limited people will return around the government offices and a little market that serves workers making it truly a tale of 2 cities (or towns). After the hydrogen explosions sent radiation into the atmosphere the wind blew the isotopes over Namie and into the north wester interior mostly missing Odaka. In the time that Odaka remained int eh exclusion zone though immense damage was done as homes fell into disrepair and people moved away. Still, it opened earlier than other towns and enough of it was saved so that three's a fighting chance that it will make a recovery, albeit a really difficult one as there is so much that the town still needs, from better shopping options to more robust social institutions. Odaka's residents were also relocated to nearby towns whereas Namie's residents were much more spread out over Japan. The combination of their dispersal with the town being closer to teh plant and therefor deeper into the exclusion zone with (still) higher radiation meant that the town was opened later. The fat that its open at all many think is just a ploy by Tepco who owned the plant and the government because with it open means that compensation payments will end and thus people will have no choice but to return. But to return to what? There's nothing to return to. In the aftermath many spoke in terms of legacy, something I thought was irresponsibly rushed because by definition a legacy cannot exist in such a short time, but the word has a certain drama to it and sells papers and time slots on tv. We are just now, 7 years on, beginning to see the legacy and that its towns like Namie are unlikely to ever return to what they once were while some places like Odaka are struggling mightily to hold on. With the atmosphere here today light and enjoyable, despite the rain, I look forward to returning to Odaka and seeing what it will be in the future. Last night I had a lovely meal in a newly opened sushi restaurant (the fish is caught in the north far away from the power plant) and this evening I'll head to an izakaya (an elegant neatly run place with superb food) that wasn't here when I was last in town. The sushi restaurant is a quarter of the size it once was and the owner, in his 70's runs it with his sone, wife and one other worker. He gets up early every day and does the work that he used to have assistance with, but with it so difficult to find skilled chefs and staff he takes on the work himself. Many businesses face such challenges, but at the very least here in Odaka people have made it this far to actually face every day challenges. But at the very least thigns are lookign up: I sat next to a couple in their 60's last night who were drinking highballs and had the spirt of young lovers. Before the meltdown they'd come to to the restaurant every Friday, laugh and shake off off the week. After a long and hard exile they moved back and with the restaurant opened they're back to their old routine with a bottle of chilled whisky on the table and smooth sushi with scallion and shrimp soup for dinner.